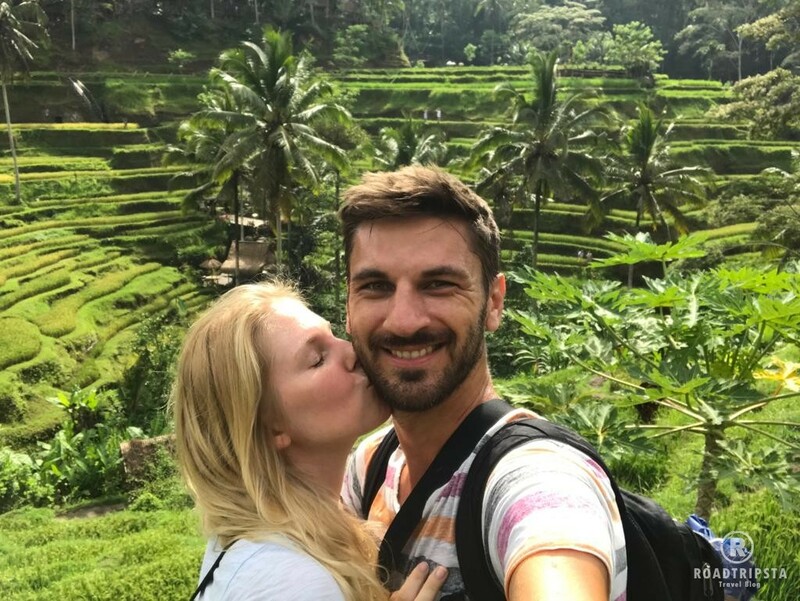 At first, we thought backpacking through India was very complicated … a chaotic traffic system,very little information online about the bus routes and generally a lot of uncertainty about traveling in this huge country. In the end our backpacking trip through India was much easier than expected. We did a lot of research before our trip and found little information about the routes between the cities. All in all, it can be said that the trips on public buses were completely uncomplicated. Normally, we took the tuk tuk to the bus station of a city and asked for the bus to our destination. Then we boarded the bus and mostly after a few minutes our journey started. The Pearl of the South …. this description is not from us, but from the travel guide we bought before the holiday. This is one of the reasons why I do not like travel guides so much. They can make any lame place sound like a true paradise with their flowery descriptions. Back to the Pearl of the South: Unfortunately, we can not confirm this description. When we arrived in Cochin in the evening we did not get a real first impression until the next day. Contrary to all the information that there are cows all over India, who walk around freely, in Cochin we have seen mainly goats, sometimes walking freely, sometimes tied to some lanterns. Another thing that immediately struck me is the garbage lying around everywhere. And really everywhere: on the street, in the rivers, in the bushes. After we bought the first drinks in plastic bottles, we also knew why. In the attempt to dispose the empty bottles we had to realize that there are nowhere trash cans. During our holiday, we always collected our garbage in our backpack and then disposed it in our homestay. They probably just dumped it on the street. 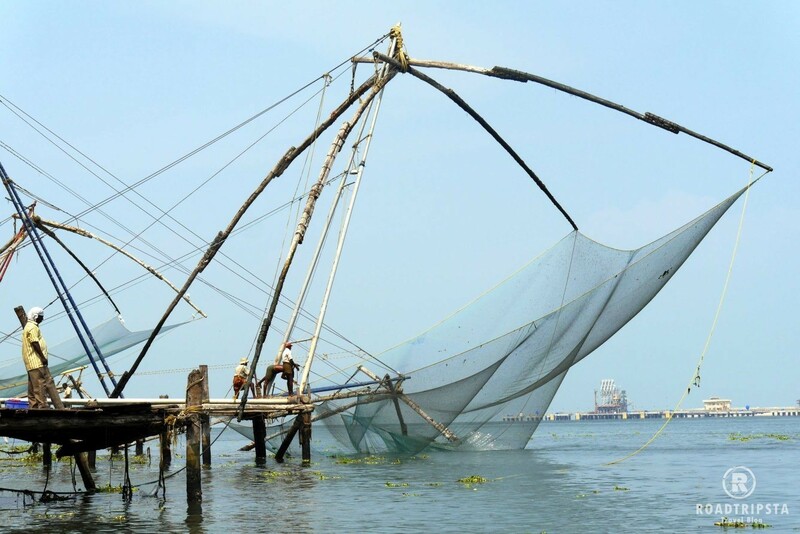 In Cochin we watched the famous fishing nets (which you can see in every guidebook) and walked around the city. Since it was over 40 degrees in March when we were there, we barely could stand the heat. Since Cochin does not really has much to offer in our opinion, we drove straight on to Alappuzha in the afternoon. In the evening we were still there on the beach and there we really stood out in the crowd as we were the only white people on the beach. One of our India highlights was definitely the sunrise canoe trip through the backwaters. We were picked up very early in the morning with scooters from our hostel and brought to a boat dock. From there we went with small boats on to a place where we changed into canoes. The canoes have the advantage that they are small enough to fit through the small channels of the backwaters. 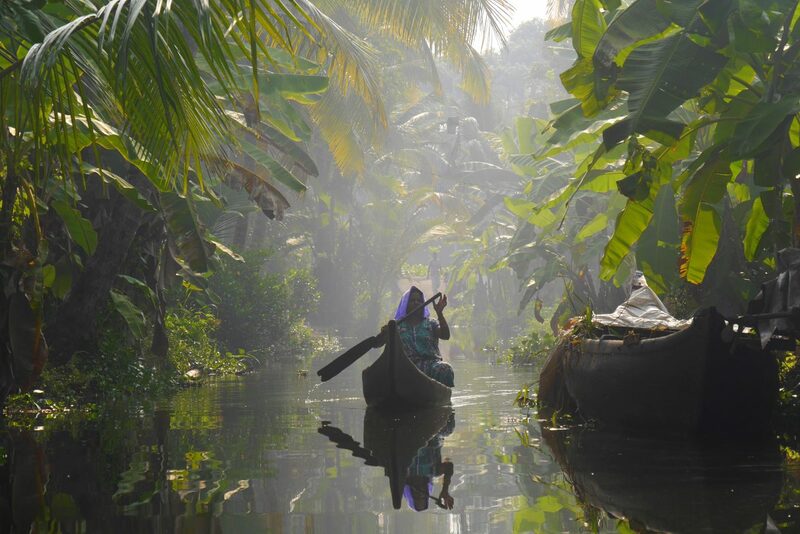 The atmosphere in the backwaters was magical …. The haze rising at dawn, the birds in the trees. All this created a very special atmosphere that made this event so amazing. In addition, you get a good insight into the life of the people on the river during the tour. On our tour we saw girls in their school uniforms going to school over bridges made of tree trunks and women washing their laundry in the river. You should definitely do the tour if you can schedule a stop in Alappuzha. After the backwaters tour we continued with the ferry to Kottayam (about 2.5 hours). This is a very cheap alternative to houseboats. You get the same view for a few cents. From Kottayam we continued by bus to Munnar. As I said … just get to the bus station and ask for the bus to Munnar. After about 4-5 hours you will arrive in beautiful Munnar. 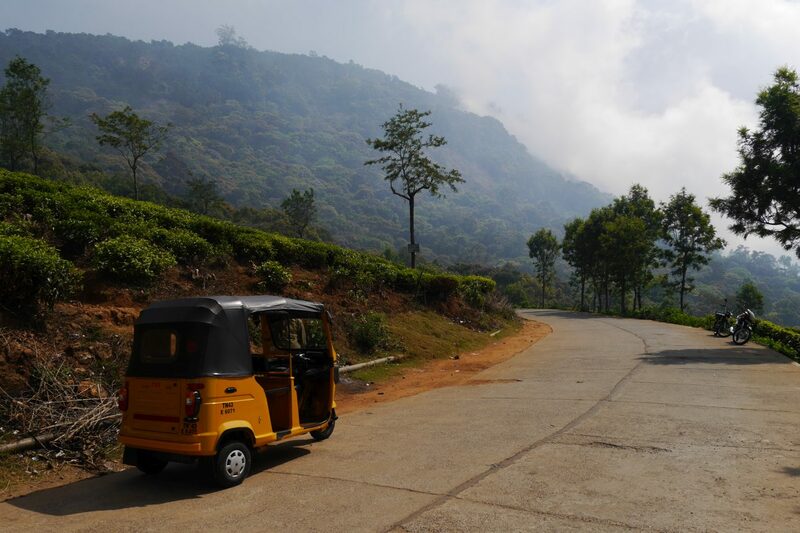 Munnar is located inland and is well known for its tea plantations. The climate is also very different here. 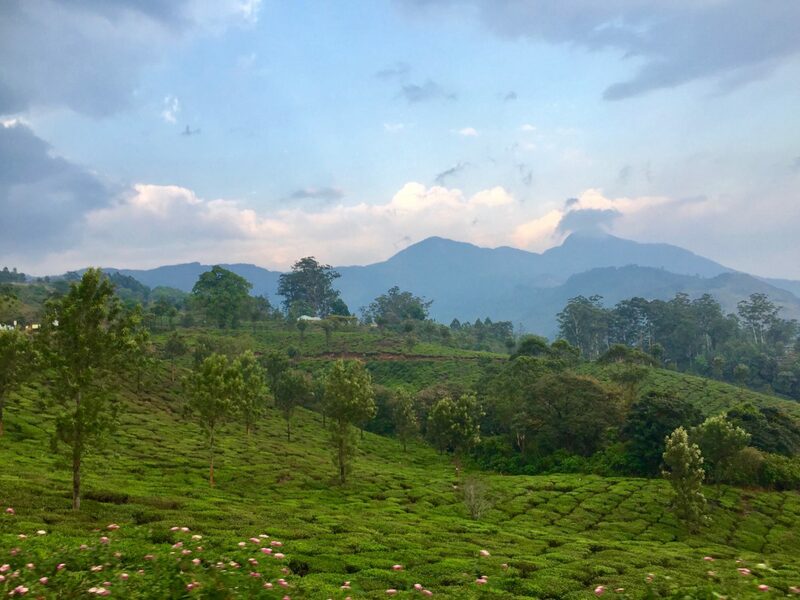 While it was extremely hot on the coast, it was pleasantly warm in Munnar and even almost cool in the evening (about 25 degrees). In our hotel in Munnar we could directly book a day trip to the tea plantations for the next morning …. and you should definitely do that. The tour was absolutely amazing. The day trip started at sunrise and this created a very special atmosphere here as well. Since it is always very loud in the towns and villages, the silence at sunrise is a complete contrast. In the first hours the tour led through the tea plantations and then up to a mountain peak. Here we had a first breakfast. From here you had 2 options. You could go back the same way or you could extend the tour until the late afternoon, making it almost a day trip. We chose the long tour. You should definitely do this too. Because only then you can see the really interesting areas. If you also intend to do so, it is best to wear comfortable shoes. The long tour (about 20 km) leads partly through the forest, but also along paved paths. The guide showed us different spice plants along the way. So we saw cocoa trees, nutmeg, vanilla and cardamom on the tour. We really liked the tour and it was another recommendable highlight on our trip through india . The evening we spent in Munnar and wanted to continue our journey the next morning. Here we had to find out that the TukTuks, of which there are always more than enough on the streets, are not around early in the morning. So it happened that we had to walk to the bus station. There we again asked for the right bus and drove on within 6 hours to Coonoor. Day 5 we had planned as a travel day. 6-7 hours of bus travel sounds a bit daunting …. but wasn’t that bad. During the journey, we have continuously enjoyed the view and the great scenery. The evening in Coonoor we spent mainly with finding a suitable accommodation. Andreas needs Wi-Fi and I need a shower …. these were too many requirements for a hotel in Coonoor. There were actually old mansions from the 19th century with Wi-Fi. But for washing one would have to use a bucket and rag. On the other hand, there was a super chic hotel with a driveway. It had showers and bells and whistles, but no wifi. Really absurd. In the end, our TukTuk took us to an accommodation that had everything but a real charm. But you can not have everything. We can recommend the Acres Wild Farmstay Coonoor. That was also a recommendation in our guide book and we decided against it because of the cost only. However, after our odyssey we should have gone there directly. Because it should be really nice there. We spent the day in Coonoor exploring the village, visiting the market and buying a train ticket for the Toytrain. This train is very popular and actually drives all the way from Mettupalayam to Ooty. Unfortunately, we did not manage to book tickets in time and therefore we could just board the train in Coonoor. Although we have missed the most scenic part, we at least had a small journey (~1h) on this train. The tickets we bought quite easily at the station. All we needed was our passports. The bus to Ooty is a bit cheaper, but thanks to the serpentine streets almost as long and is probably not as scenic. In Ooty we stayed in a real hotel and went on a day tour with a TukTuk. So we could visit the most popular sights and our driver just stopped us where we wanted and waited for us while we were out taking pictures. Since there are many national parks in India, we wanted to take the opportunity to do a safari there. While India is a very cheap travel destination, there are real tourist prices here. Per person we paid $ 120 for 2 days. Pretty hard! The journey to the K.Gudi Wilderness Camp was quite adventurous. 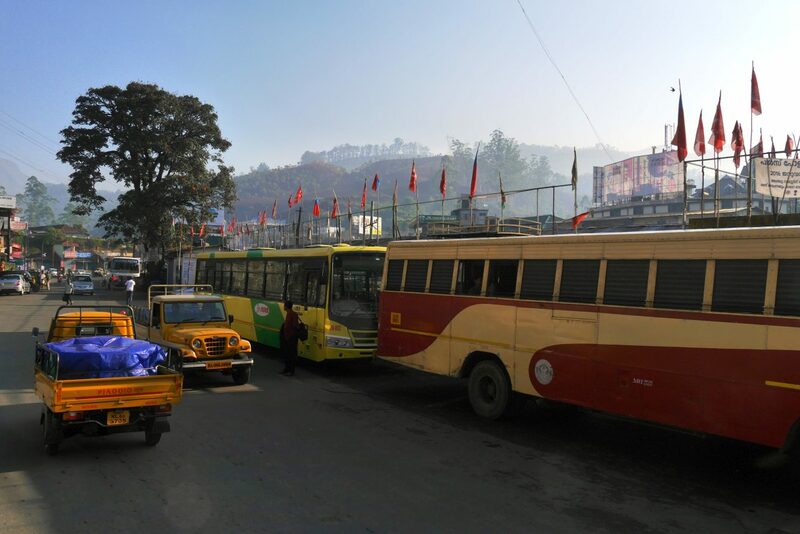 We took the public bus from Ooty to Gundulupete to drive from there to the National Park. Of course, the TukTuk came to mind as a favorable option. We went to the next TukTuk driver, negotiated the price shortly and off we went. After about an 1h drive we were already at the entrance of the park …. and that’s where the TukTuk driver stopped and told us that he was not allowed to drive into the park. From the entrance of the park to the camp, however, it was still a few miles and by foot you were of course not allowed to enter the park. The people at the entrance of the park told us that in a few hours a bus would arrive tha could take us to the camp. Since we were already too late for lunch and should start our booked safari shortly we could not wait so long. We felt like crying! We were sitting right in front of the entrance gate and did not get in. By telephone we could reach no one from the camp, so that our mood was at a low point and we did not know what to do. Fortunately, after some time, a motorcyclist came out of the park and spoke to us. He was from the camp and was able to clear everything, so that we were picked up a short time later at the entrance gate. At the camp, we got something to eat quickly and then started our first safari. The safari was very nice, but there weren’t many animals. But on the next morning we had another safari and hopefully we would see more. Although the park is praised as many others as a “Tiger Reserve”, the chances of seeing a real tiger are, of course, negligible. Day 9 started with another safari, in which we unfortunately did not see many animals. Only a few monkeys, buffalos and birds. When we got back to the camp, we suddenly saw some elephants there and were really happy. Later, however, it turned out that these were domesticated elephants, some of which were even chained. If we had known that before, we would not have visited the park. We do not want to support such treatment of animals. After this negative experience, we went out of nature and on to the big city. 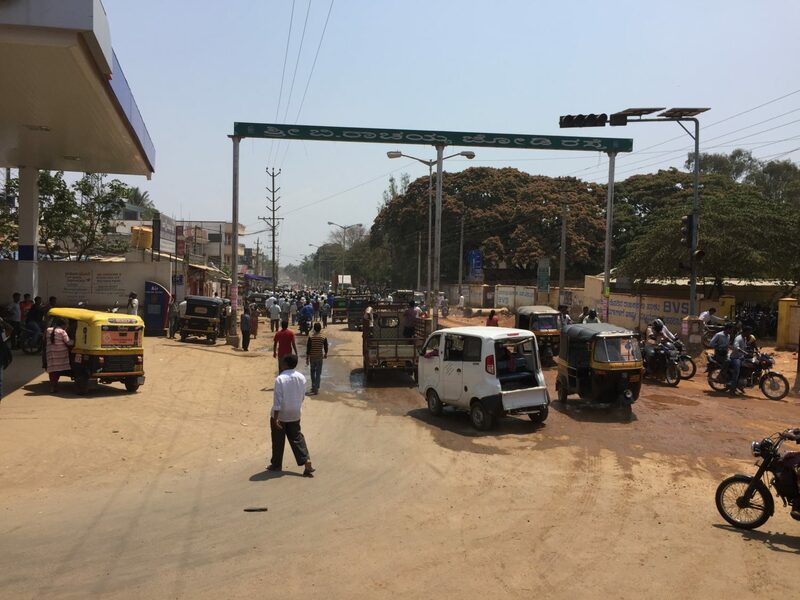 Within about 2 hours we were in Mysore and were directly shocked by the noise, dirt and stench. The food was really great! Our tent was very comfortable and you can spend great time on tree swings and hammocks. In the afternoon we were taken by a jeep to the next large city and took a bus to Mysore from there. 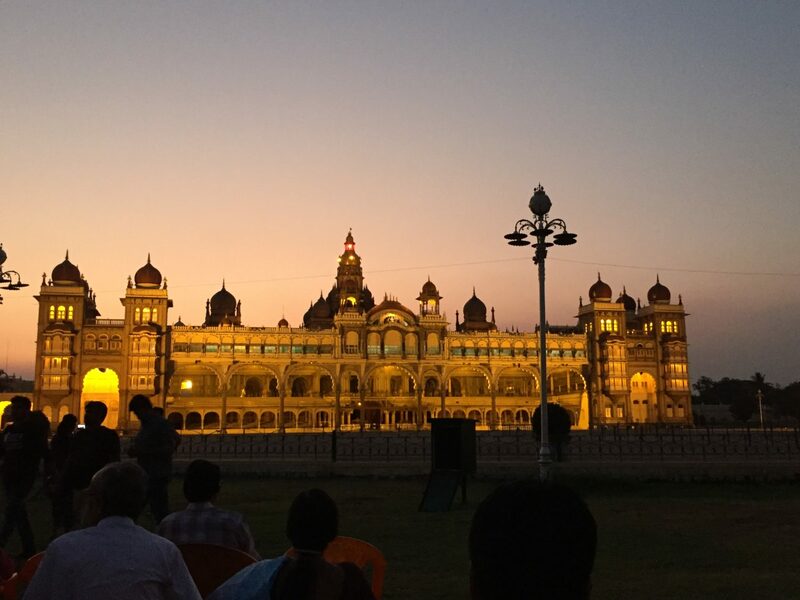 After we arrived at the hotel we went to the Maharadja Palace. It is illuminated and music is played in the evening. That was interesting for a few minutes, but then it was quite annoying. We left after 20 minutes. The next day we looked at the palace again in daylight and also from the inside. The palace is definitely worth a visit. You can not officially take pictures, but nobody really controls it and there are really a lot of great photo opportunities. We spent the rest of the day at the market, but when it got extremely hot at midday (almost 40 degrees), we flew into the mall to enjoy the air con. Here we also saw the first time in over a week a real supermarket and went shopping instantly. We also took a break from Indian food and had a burger at McDonalds. In the afternoon we got out of the mall again and visited the city a bit until we went to the train station in the evening. To get from Mysore to Hampi we took the night train (12h). This saved us the cost of another night in a hotel. The train tickets we booked in advance online and chose, in order to be able to sleep well at night, the first class with AC. The ride was very pleasant, so we could sleep a few hours at night and arrived the next morning in Hospet (the entrance gate of Hampi). We’re not real city people anyway, but we think the city does not have much to offer except for the palace and the market. We would not spend time there again. From Hospet we went by TukTuk to Hampi. Hampi is a world of its own and has always reminded us strongly of an Indiana Jones movie. The rocky landscape with the temples is simply breathtaking. And it is exactly this great landscape that was responsible for being surrounded completely by tourists. Hampi is a tourist destination, but worth it anyway. To explore the important and beautiful temples, we took a TukTuk from temple to temple. From the last temple we walked back to our hotel, which turned out to be a very nice evening walk through the rocky landscape and along the river. Quick tip: The TukTuk driver promised us that he would drive us for as long as we wanted. But you can only take a very limited route anyway, since no vehicles are allowed from a specific point. Therefore, we have used the tuktuk for about 2 hours only. We had to get up early for our next day in Hampi. We heard that you can see a beautiful sunrise from Matanga Hill. So it started in the early morning and went up the hill. We needed about 30-40 minutes for the ascent. Once at the top we could enjoy a magnificent view of Hampi, the surrounding area and the sunrise. The excursion to Matanga Hill is worthwhile and should be on every todo list. The rest of the day we spent on the other side of the river. Here we rented a scooter (this is only possible on this side of the river) to explore the area. Due to the extremely high temperatures of over 42 degrees (!! ), it was partly unbearable. It was worth it anyway, because the area here is again very different than Hampi, although there are not as many temples. To get to our next destination, Goa, we bought tickets for the night bus. The comments, which we have read in various online forums, have presented the ride as an absolute horror … but we found it quite ok. The sleeping cabins are always designed for 2 people and are very tight. If you travel alone, it is best to book 2 beds, otherwise you have to sleep very, very close next to a stranger. In addition, the cabins are very short. For Sabrina with her 1.60m that wasn’t a problem. For me with more than 1.90m it wasn’t that easy to sleep in the cabin. However, apart from the small cabins we slept very well during the night until the driver woke us up at 5 AM with a loud “Palolem, Palolem” (the name of the beach where our hotel was located) …. so we got up, quickly packed our stuff and got out of the bus. After the hectic waking up, we were dropped in the dark somewhere in the middle of Goa. Fortunately, there were a few other tourists who knew the way to the beach. So we walked about 30 minutes until we arrived at our cabins on the beach. Since it was still early morning and dark, we sat on the beach until sunrise, fed the dogs and played with the puppies, which were all around. In Goa we spent the most relaxing days of our vacation. Most of the time we relaxed on the beach, went for a walk, swim or canoe. In Goa we also experienced another highlight… Canyoning. We didn’t do anything like this before. We book the trip with Goa Jungle Adventure. It is advisable to book it a few days in advance, as not every day every tour takes place. We were lucky that we could book a beginner’s tour for the next day. On a canyoning trip you hike through rivers, jump from rocks into the water or do abseiling. The trip was very well organized and was a lot of fun. So if you’re going to Goa, definitely plan a day for canyoning. From Goa, after 3 relaxing days, we continued by flight to Mumbai. The last two days of our holiday we spent in Mumbai… and unfortunately we have to say: it was ok, but we would have preferred to spend more time in Hampi or Goa. Mumbai is a huge city… and so it was loud and dirty again. But it is worth going there for the trip to the slum Dharavi. Do not visit the slum yourself. There are organizations that guide you through the labyrinth in the slum. You are not allowed to take photos out of respect for the inhabitants. For the tour you meet at a train station. Apart from us, all participants have been picked up. However, the journey to the meeting point is not a problem at all. 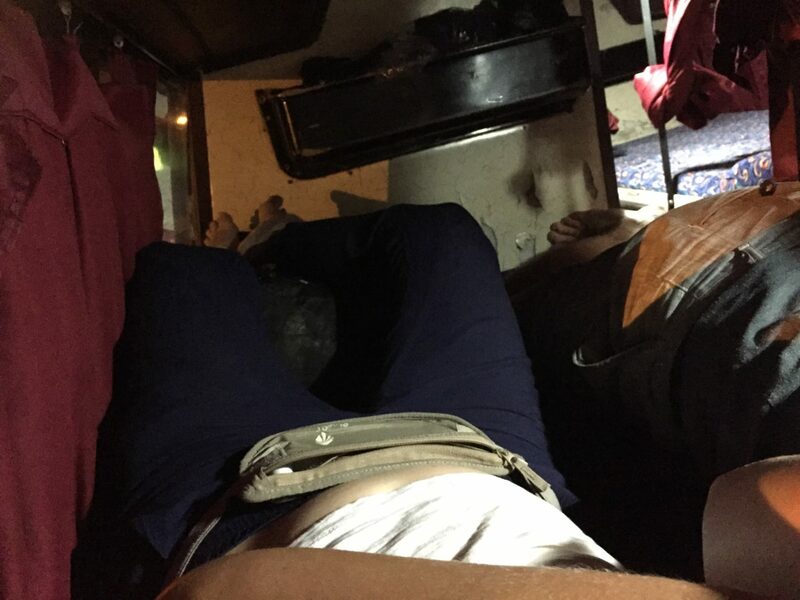 We always felt very safe in Mumbai and generally in India and had no problems with traveling by public transport. For a trip to India, you must first apply for a visa online. For travelling in india, a visa is sufficient for 30 days. To apply, you must complete the application form, upload a biometric photo and pay about $ 60. Completing the application is more complicated than expected… they really want to know everything about you and your parents. What you do for living, where you travelled so far and so on. Take care of it a few weeks in advance. Bus driving in India is easier than expected. Just go to the asked station and for the desired bus. However, taking a bus ride in India also means … the buses are old and rickety, often have no windows and the doors are sometimes open during the ride 🙂 There are no real timetables, but buses always go from every big city to any other big city. In most small villages there are no supermarkets. You can usually buy only small bananas, chips, biscuits and, depending on the region, fried pastries. In the tourist areas there is mostly western food available… for those who do not like Indian food. India is a very cheap travel destination. We each spend about 1100 € for the holiday… including 600 € for the flight. Especially the trips by bus were super cheap. Sometimes it was only cents. The TukTuk were a little pricier. You usually pay a few Euros for a trip within a city. In Mumbai (and other places) we have read the notice in many hotels that double rooms are only given to married couples. This is often alsowritten in the hotel conditions at booking.com. The reason for this is that many hotels are run by Muslim owners. We were afraid to take 2 rooms, because we had booked a hotel that had this condition on their website. We arrived at the hotel, and were welcomed by the staff in traditional Muslim costume, but nobody asked for a marriage certificate or anything else. I think that’s the way it works in most hotels, so you should not worry too much about this. This is not very easy, because as a foreigner, you can not book tickets online. That’s why we have done that via www.cleartrip.com . On this website you can book any train ticket and it works hassle free. If you are blond and female then be prepared to be stared at and photographed often, sometimes even secretly. At least my girlfriend did experience that. However, in the vast majority of cases the experience was positive. Most of the people asked kindly if they could take a picture of or with Sabrina. This has happened to us everywhere, even in Mumbai, where you would think the people are used to see tourists. But even there we have not seen many other white tourists. So be prepared to feel like a Hollywood star! Do you have any questions or want to share your own travel experience with us? Do not hesitate to drop us a comment or even share this article on your favorite network.